Creforce was the name of the Commonwealth and Allied Forces of Crete. 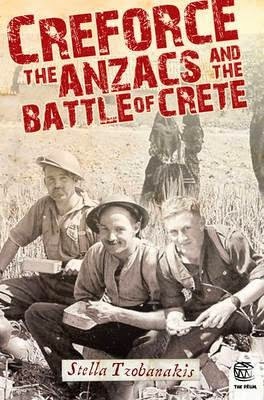 This reissue from The Drum series concentrates on the Australian and New Zealand Forces that took part in the historic ten-day Battle of Crete. It also covers the invasion of the Greek mainland, and includes an expansive history of WW2 during those catastrophic times. The Battle of Crete was fought in May 1941, when German paratroopers fell from the sky, with the ANZAC, British and Greek units defending the island. The Germans encountered mass resistance from the island’s population. The Cretan’s knowledge of the mountains and their ability to survive there indefinitely proved to be their greatest weapon against the German invaders. Lack of food forced soldiers to depend on the charity of strangers. What little they had was shared with the soldiers. Whole villages paid if a person was discovered harbouring an enemy of the Germans. The accounts of the Allied soldiers’ heroic attempts to fight with a shortage of guns and ammunition, in tattered clothing and shared boots, is deeply moving. The statistics here are amazing. The layout is terrific. Its informative fact boxes include biographies of famous people associated with the Greek Resistance. Archival photos appear throughout the book. Customs, traditions, language, music, and past history of the island form the background of this comprehensive narrative on the invasion of Greece and Crete during WW2.